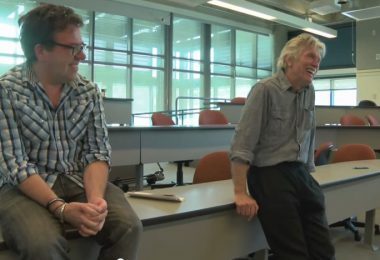 Veterans on Wall Street (VOWS), enjoyed a lively session with Tom Skerritt. 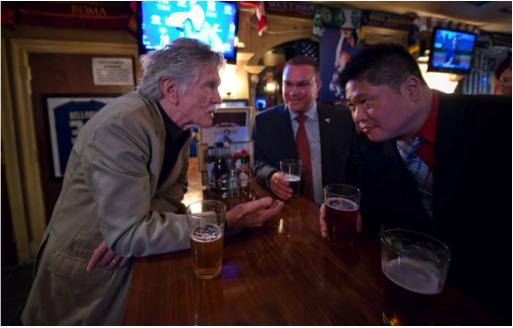 The Bob Woodruff Foundation invited former Air Force Vet, writer-actor, Tom Skerritt, to speak to Wall Street bankers; ‘Volunteers On Wall Street’ (VOWS), about The Red Badge Project. Foley’s Irish Pub in New York provided a lively setting for the Wall Street group, which supports Veterans needs, gathered to learn about the power of storytelling as it redirects military discipline into creative discipline and the freedom of self-expression that is a significant step in the trauma recovery process. Skerritt noted that the alarming numbers of suicides of Post Traumatic Stress (PTS) soldiers and future social implications of as yet undetermined PTS cases, were driving forces in the founding of The Red Badge Project. With the support of retired General Pete Chiarelli, and Evan Bailey, Captain, US Army (Retired), The Red Badge Project began at Fort Lewis, JBLM four years ago. Today, as an alternative therapy program based in storytelling, The Red Badge Project works in concert with current military psychiatric treatment, targeting soldiers and veterans struggling with severe Post Traumatic Stress (PTS), across all services, generations and conflicts. Emphasizing the story within (never the war), instructors infuse music, movement and laughter, to lower the PTS surveillance and anxiety guard, freeing emotions and creativity. “Telling the story… is a significant step in the trauma recovery process no matter what array of symptoms is present.” (Elements Behavioral Health’s Trauma Treatment; 2015). Early Red Badge Project data indicates two significant trends: 1) increased sense of self-efficacy (ability to positively impact treatment) and 2) improved sense of hope (critical for suicide prevention). The Red Badge – The cornerstone course at UWT provides a civilian atmosphere conducted in educational surroundings, including academic credit, awarded at no cost by UWT. In Your Voice – This six week program meets weekly at various Vet Centers throughout the greater Seattle metro area. Multi-generational veterans work together to help heal old wounds with therapy not available during their transition from service. 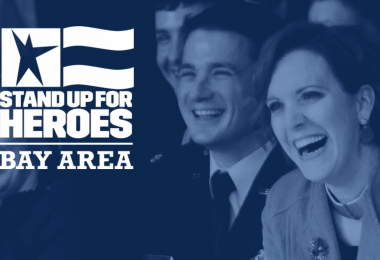 Women’s Voices – Developed specifically for female veterans facing challenges that differ from their male counterparts, including military sexual trauma. The class and weekend retreats are always at capacity, sometimes with wait lists of 25-30 women. 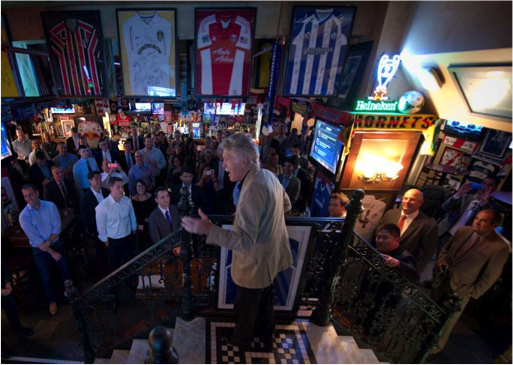 MANHATTAN (July 19, 2016) — American film & television icon Tom Skerritt talks to U.S. military service veterans in the financial industry and who are members of the group Veterans of Wall Street (VOWS), at Foley’s Irish Pub in downtown Manhattan. As a special guest of the Bob Woodruff Foundation, Skerritt talked about his program The Red Badge Project, a storytelling workshop designed to support veterans suffering from Post Traumatic Stress and traumatic brain injury.